Amal Alamuddin’s $750,000 Engagement Ring From George Clooney—Experts Weigh In! If you haven't…well, have you been hiding under a rock? And was that rock the same size as the massive stone the Oscar winner presented on bended knee? Because only then would we understand why it's taken you so long to crawl out from underneath and check out this photo. We're joking of course, but the 7-carat diamond that the Gravity actor picked out for his soon-to-be wife is humongous. 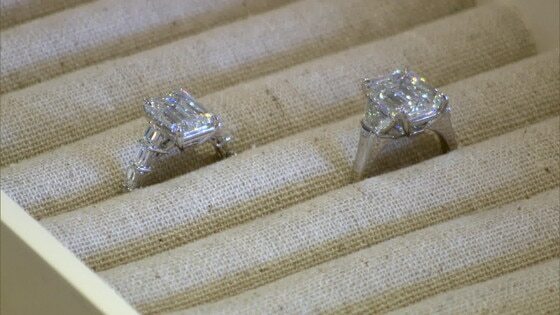 Jeweler Jean Dousett even estimates the emerald-cut diamond, which is set in platinum, to cost around $750,000! Clearly Mr. Clooney spared no expense when he finally found The One. To be fair, it took a really long time (over two decades of dating!) to get here—but we couldn't be happier for the betrothed couple. To get more details on the engagement ring—including why George chose an emerald cut—and get up close to two nearly identical replica rings, watch the video above.